Living gets a lot wilder and dirtier for kids and our homes during summer's school-free days. Summertime and the living is easy... If your kids are in year-round boarding school, that is. If not, as moms everywhere know, living gets a lot wilder and dirtier with our little darlings at home all day. 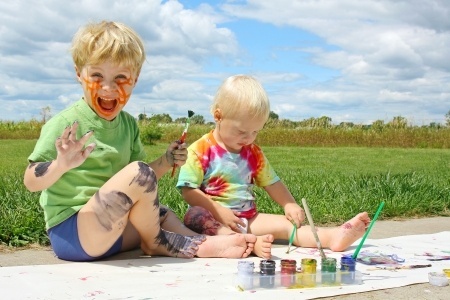 How will you (and your home) survive this constant onslaught of mud, fingerpaints and toys? These 8 summer cleaning tips can help you keep your home looking crisp and clean during this busy time. Set a summer cleaning goal of having a clutter free home. Having lots of stuff around leaves plenty of places for dust and allergens to collect. If you haven't already, do a bit of decluttering now to get the ball rolling. Few of your summer guests will notice dust on top of your refrigerator, but they will see items strewn about the living room. So make clutter control a part of your summer cleaning routine. If you have only a few minutes before guests arrive, opt to tidy instead of clean. Get the kids to help with summer chores. By making a clean, clutter-free home the precursor to a fun activity, such as a day at the beach or lake, and by helping your child master the cleaning tasks, you can make housecleaning an enjoyable, confidence-building activity. And thanks to summer, there's finally time to get almost everything done. Clockwise cleaning. Move clockwise around each room, putting away clutter and mislaid items. Stash any stuff that doesn't belong in the room outside the door to sort and put away later. Dedicated dusting. Dust shelves, windowsills, mini-blinds, lamps, tables, bureaus and TV/computer screens with a clean, damp cloth. (Dusting with a dry cloth can eventually scratch or dull the finish.) Rinse the rag regularly. Mirror magic. Make your mirrors and windows shine using a vinegar-and-water glass cleaner solution and a squeegee. Wipe down woods. For shiny hardwood surfaces, you don't need fancy or expensive cleaners. In fact, they often leave a residue that will attract even more dust. Instead, use a soft cotton or terry cloth, or a 100 percent cotton diaper. Lightly moisten the cloth with water and gently buff the surface along the grain to remove spills and fingerprints. Stop dirt and sand at the door by having people remove their shoes before entering. If that sounds a bit drastic, invest in a good door mat that's gentle on feet. Even your little stomper can wipe shoes on entryway rugs or front door mats to protect floors and carpets. Inside, to make summer cleaning easier, place washable rugs in high-tragic areas to prevent sand and dirt from being tracked from room to room. Confine eating to the kitchen or dining room so you won't be chasing crumbs throughout the house. Here is where summer cleaning challenges can get tough. But you don't need to buy buckets full of special cleaners to keep everything looking good this summer. 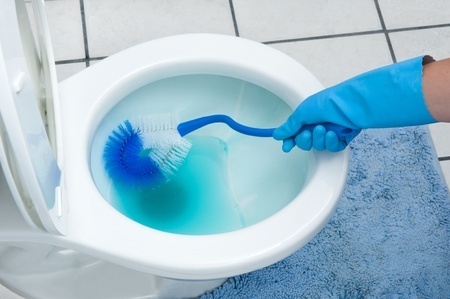 Four basic products can get all the dirty bathroom jobs done: an all-purpose cleaner; a tub, tile and sink cleaner; a toilet-bowl cleaner; and a glass cleaner. The best and least expensive glass cleaner, by the way, is a homemade mix of 1/4 cup of vinegar in 3 3/4 cups of warm water. You'll also need tools: a long-handled toilet brush, a sponge (preferably a scrubber sponge), a squeegee, a dust cloth and paper towels. Save time by spraying cleaners on areas that need extra soaking time, such as the toilet, tub and shower, while you tackle other surfaces. Sanitize the bowl. Squirt toilet bowl cleaner around the inside of the bowl and under the rim. With a long-handled toilet brush, swish the cleaner around the bowl, under the rim and as far into the trap as possible. Sanitize the bowl with a thorough cleaning for a summer fresh home. Let the solution stand while you clean the seat, lid and outside of the bowl with an all-purpose cleaner and a sponge, cloth or paper towels. Paper towels are best: No rinsing is needed, and there's no chance of spreading germs, since you'll toss out the paper towels immediately after use. Tame the scum. Soap buildup makes for icky bathrooms - not what you want guests to see as they change into swimsuits. Spray the shower, tub and sink with a tub, tile and sink cleaner. Let it sit while you complete the remaining steps. Clear the deck. Clear the countertop of personal items, and spray the surface with an all purpose cleaner. Wipe clean with a sponge or paper towels and replace your toiletries. Shine on. Spray glass cleaner on a cloth and clean the mirror. Squeegee dry. Use glass cleaner to make faucets sparkle, too. Scrub duty. Use a scrubber sponge to loosen and remove soap scum and buildup on the tub or shower. Rinse clean. To make this task easier in the future, keep a squeegee in the shower or a sponge in the tub. Wipe down the shower door and walls or sides of the tub after each use to help prevent soap-scum buildup. To keep mildew in check, open the shower door or curtain after use to let it air-dry. If mildew already has a toehold, scrub the surface with 3/4 cup bleach in 1 gallon water; rinse clean. Now for the floor. Vacuum or sweep, then mop. Garbage detail. Empty the trash can and take the bag with you. Kitchens are a potluck of dirt, grease and germs. To make this room a sunny haven, you'll need an all-purpose cleaner, a glass cleaner (or the vinegar and water mix), hand dishwashing detergent, a clean dry cloth, a scrubber sponge and a scourer (the ball-shape, woven-plastic kind). Unclutter. Put everything in its place, from the dishes languishing in the sink to the kids' drawings on the kitchen table. Remove everything from the counters. Put oven mitts and dish towels into the wash. Toss anything in the fridge that's past its prime or that the troops are unlikely to eat. Spot patrol. Don't waste precious summer moments scrubbing dried-on foods or baked-on spills on counters and the stove top. Give them a generous spritz of all-purpose cleaner and allow the cleaner to penetrate the grime while you move on. Oven duty. Remove the oven racks. Scrape off any burned-on stains with a dull knife held at a 30-degree angle. Use an oven cleaner for manually cleaned ovens. If you have a self-cleaning oven, simply turn it on and let the appliance clean itself. Don't use an oven cleaner in a self-cleaning or a continuous-cleaning oven, however. it may damage the surface. To eliminate the need for frequent deep cleanings for the rest of the summer, sponge away oven spills before they dry or are burned to a crisp. Surface duty. Work your way around the kitchen, cleaning all the surfaces. First, wipe up the spots you sprayed earlier, then use an all-purpose cleaner for a general wiping of countertops, the oven exterior, cabinets, the dishwasher and refrigerator. By making one thorough cleaning trip around the room, you're sure to hit all the surface hot spots. Finally, spray a disinfectant cleaner on the countertops and refrigerator handle and let it sit for at least 10 minutes. Clean the sink and faucet with a sponge and dishwashing liquid or all-purpose cleaner. To make the faucet sparkle, spritz it with a glass cleaner and polish dry. Wipe the countertops and refrigerator door handle clean of disinfectant. Floor it. Sweep, then mop the floor. Your front door, entryway and patio should be bright spots for entertaining. Fortunately, these areas require little effort. Sweep it up. Sweep the front walkway and porch; prune any yellowed leaves on porch plants. Lighten up. For safety's sake, light the walkway and porch well. On the patio, more indirect lighting may be preferable. Promptly rinse summer stains on clothes to keep them from becoming permanent. Summer is when Murphy's Law invariably comes into play: If something can spill, drip, ooze or run, it will spill, drip, ooze or run all over your favorite shirt or sundress. Fortunately, once you know how two treat these troublesome summer stains, you can keep beloved clothes from ending up in the rag pile. Get more tips on removing a few typical summer laundry stains here. Practice prevention this summer when it comes to housecleaning and cleaning products. Show kids the safe way to use cleaning products when they go about their chores. Store your cleaning supplies safely out of reach of curious little hands.